Unilever has launched a site called Introducing Domestic Donald which features a cartoon body topped with Donald Trump's head. Spouting off Trumpy one-liners, The Donald wanders about a kitchen responding to requests to do the laundry, wash the dishes, prepare dinner, wash clothes and mop the floor. The whole thing's a sweepstakes offering for a "Luxury Weekend With Donald Trump" that requires the entry of a code found on stickers affixed to promotional packs of All detergent. 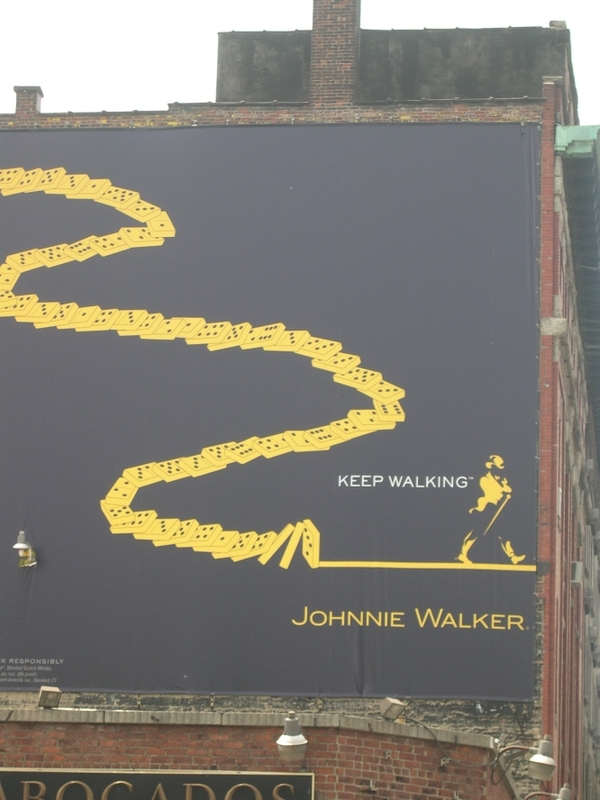 Adrants reader and Animal Publisher Bucky Turco comments on the Johnnie Walker "Keep Walking" outdoor campaign which has featured imagery that conveys forward motion or progress. Recently, Turco noticed an execution of the campaign that used dominoes as imagery and questioned the choice of that visual as it relates to spririts advertising, commenting to Adrants, "The other day I came across this Icon ad that featured swirling lines of falling dominoes. The image of falling dominoes seems a dubious illustration to use for progress, especially for a spirits brand. Does it mean that if you don't drink enough JW your life will begin to "fall like dominoes." Could it mean 'Keep Walkin' fast this way so your drinking troubles don't catch up with you? 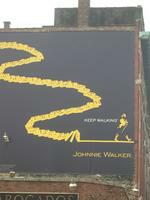 Or is simply 'Keep Walking,' even if its not in a straight line?" Spirits advertising has to walk a fine line between imbuing a sense of adventure and excitement and the plain truth alcohol can make you drunk and stupid. Perhaps this illusory image of dominoes gets a bit too close to crossing that line.